Today I managed to get the engine to do real graphics and gameplay of models made last weekend. Lighting is pretty good. Not sure about shadows cast by larger asteroids. 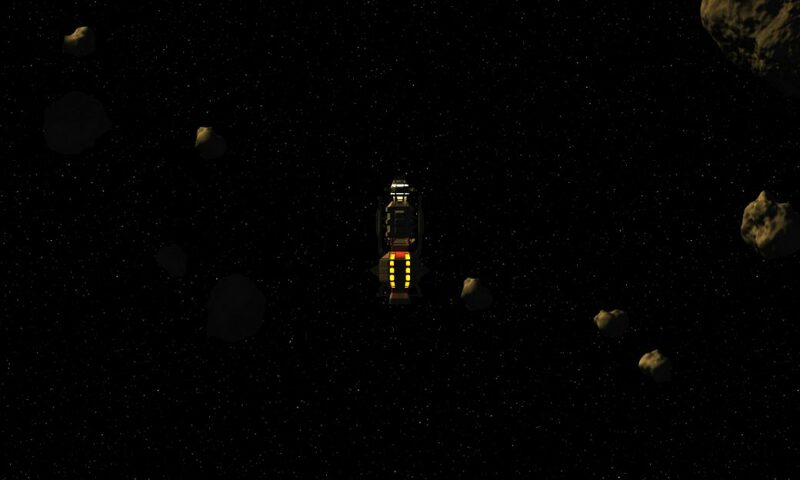 Ship does need some spotlights, otherwise navigation in the dark will be difficult. This will have to wait until Godot’s team fixes a bug affecting it. Hopefully, soon. I will probably need a moving parallax background to indicate movement outside the ring. There were some obstacles to overcome. As much as I like the Godot Engine, version 3.0.2 is still pretty buggy, and there are many poorly documented quirks. I lost few hours today figuring out why the stars in background is not repeating itself, just to find it is a bug in sprite – while documented as such, repeating texture just does not work on sprites. TextureRect, however, works just fine. I had some problems in finding a good way to avoid asteroids spawning atop one another. I ended up using physics engine to do a test move and check for possible collisions, and it works beautifully. At the moment asteroids are not spawning continuously, so I can escape the field. I should probably add continuous spawn just after first controls. Ship control right now is a hack – I need to place actual thrusters around it and write some auto-pilot logic to allow smooth navigation. There should be, however, ways to control thrusters directly. Next thing to add should be asteroid collision logic. Right now they just bounce off from one another, and they should be raising clouds of dust and even breaking apart after greater collisions. That’s a task for tomorrow. Overall, a great day with solid progress.